“I am proud of this award. It demonstrates commitment to continuing improvements in avoiding unnecessary hospital stays,” says Mr. Joseph Ramon, CEO of Health Care Unlimited. “We will continue to work with TMF and referring partners to improve patient care and to maintain the quality care that our partners have come to expect and depend on from HCU for the last 20 years,” he added. In the past, Health Care Unlimited has received various awards and recognition from TMF Quality Institute ranging from Home Health Quality, Statewide Quality Improvement and Upper Body Dressing. 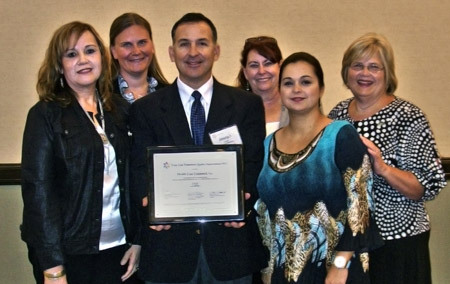 TMF is a private, non-profit organization which is the designated Quality Improvement Organization for the state of Texas, contracting with CMS to work with providers and health care community leaders through-out the state of Texas on national quality improvement initiatives. Health Care Unlimited, Inc is a home health agency which has served 19 counties of South Texas for over 20 years. A talented team of providers is available 24 hours a day, 7 days a week to provide skilled services with the patient’s unique needs in mind and in direct coordination with the hospital or physician’s office. Other services offered by HCU include Primary Home Care, Community Based Alternatives, and Private Duty Nursing as well as DME services. Site best viewed in Firefox or Google Chrome. Page Generated in 0.0158 seconds.